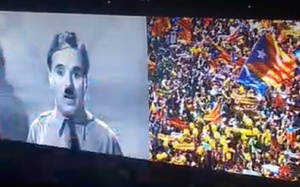 Having announced that their current European tour would be based on standing up for “democratic European values”, the group’s concerts on the tours have opened with a powerful video collage of historical images on the theme of people power, accompanied by Charlie Chaplin’s famous pro-democracy speech from the film “The Great Dictator”. Posted in Misc and tagged Catalan Independence, U2 at 4:39 pm on September 24, 2018 by Bodger. 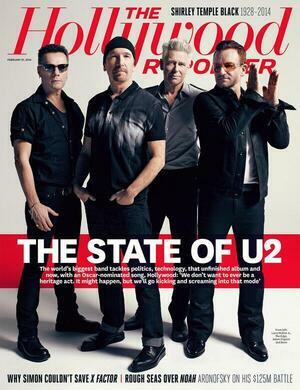 Obviously, because it’s all about the big dumb show and getting the audience clapping like trained seals. You’d hardly expect U2 to have the courage of their (faked for cheers) Catalan Independence convictions and show it in Madrid! The pro-Brexit, Union Jack waving version for the London will probably be edited out for Dublin… hopefully. Who’s ever taken U2 seriously? And even those few who did lost the faith when the boys moved their tax arrangements to more salubrious climes.